We packed for our honeymoon quickly, almost as though we had gotten away with something and needed to leave town immediately. In reality, we’d shoved any non-essential wedding tasks aside, and by the time we needed to pick up the rental car, I had little energy to plan ensembles. So I shoved a handful of basics — light jeans, white tees, that sort of thing — into a bag, and off we drove to Montréal. 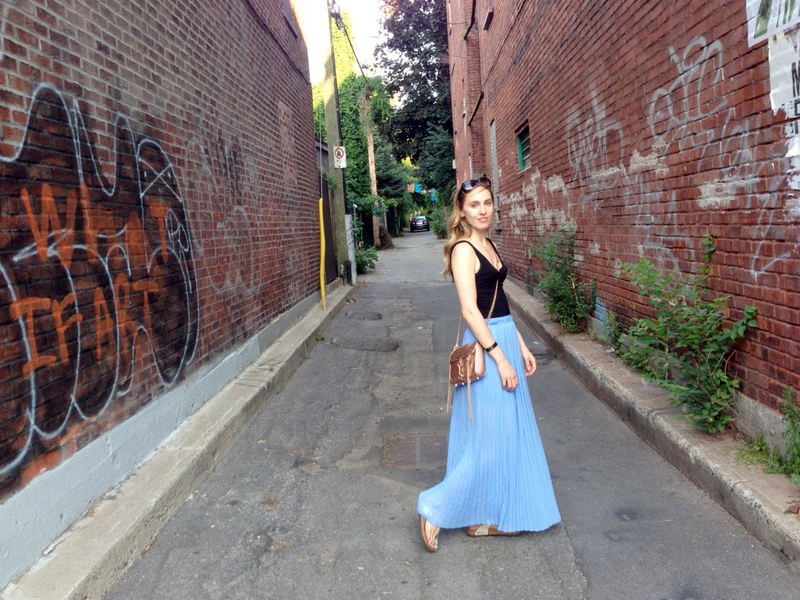 I’d bought this maxi skirt on sale at Zara, imagining it to be one of those easy-to-wear, summery staples. Unfortunately, the skirt was a saboteur in disguise, a garment that looked breezy and simple in the store but was actually out to ruin everything. Everything! For instance, I didn’t realize how much leg its side slits would show as I walked, rendering the garment much less modest than it initially appeared. Nor did I think about how its flapping, flowing fabric could pose a challenge when we zipped around on bikes. (The solution was to tie the long strips of fabric around my waist, which put my thighs on display throughout much of Mile End.) Also, even when the fabric wasn’t dancing in the wind, it was more sheer than it had appeared in the dressing room. So, Montréalers, I apologize for all of last week’s gam-flashing. And now — soon, anyway — back to our usual programming.